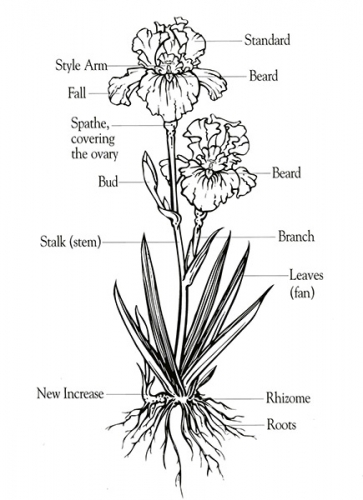 Below is a drawing identifying the various parts of the Bearded Iris. This applies to all forms: Dwarf, Median and Tall Bearded Iris. Once the label is removed from a rhizome at planting time all Iris look exactly alike. If you want to keep track of the variety name (or color) make a chart of the Iris as you plant them. Keep this chart handy for reference when they bloom in the spring. Another way is to prepare a permanent garden marker with the variety name and place it next to the rhizomes. These garden labels are readily available at many nurseries and garden supply stores. 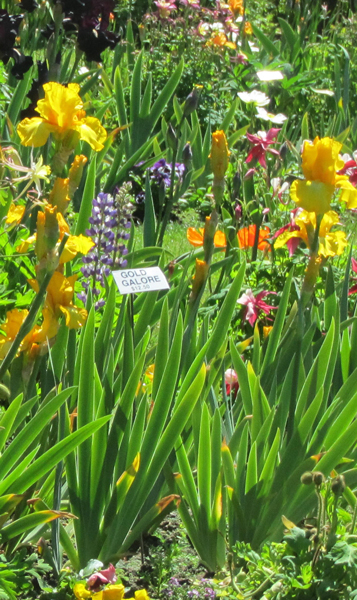 How many Iris varieties does Schreiner's Gardens sell? We sell about 1000 different varieties and grow hundreds more named Iris for observation and enjoyment. Why are some Iris so expensive? A new Iris offered to the public for the first time is called a New Introduction. New introductions are priced at $50.00 or more the first year. 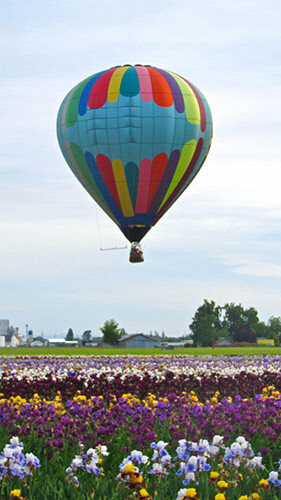 In successive years, there are more plants available so the price goes down. The price of an Iris is based on supply and demand. Are there any organizations I can join for Iris lovers? Yes, the American Iris Society is a non-profit volunteer organization made up of dedicated Iris lovers. Their goal is the promotion of the culture and improvement of Iris. Visit the American Iris Society website. Are there some Iris that are good for a water garden? Yes, there are some Iris that prefer wet conditions. The Louisiana Iris, for example, are natural water or bog plants. The are native to the Southeastern US, and are commonly found along the edges of ponds. The Siberian Iris prefer wetter conditions than the Tall Bearded, but generally do not grow submerged in water, only near it or in very moist soil. Visit the Society for Louisiana Iris and the Society for Siberian Irises pages for more information. How do I learn more about Iris? Go here to read our About Iris page. We also carry excellent reference books on Iris. Do Iris have a fragrance? Most of the Tall Bearded Iris we sell have at least a faint fragrance. Some have a more potent fragrance than others. Consult our catalog for specific Iris that have a strong fragrance. We also offer a discounted collection that features several of our most fragrant Iris. How can I get an Iris Lover's Catalog? Our 72-page full-color Collector's Edition of the Iris lover's catalog is available for only $5.00. You may order a catalog online, or you may call us toll-free at 800-525-2367 (leave a message if you call outside of our business hours Mon-Fri, 8:00 a.m. to 4:30 p.m. PST). If you place an Iris order this year, you will be added to our mailing list and receive next year's catalog free of charge.